Smother the kids in sunscreen and grab your beach chair because it’s that time of year again. Yes, that’s right, it’s summertime and by our clock, that means it’s just about time for Decatur Beach Party. Those of you who didn’t think Atlanta was a beach town have clearly never attended this sandy spectacle. Here’s how it works – The nice people over at Decatur Business Association are going to transform downtown Decatur into Ponce Beach by dumping 60 tons of sand in the square. But sand alone does not a beach make! That’s why there will also be a kids’ boardwalk featuring activities and music from Douglas Brake and the Sizzle, Hiss, Pop Band. The adult beach partiers can dance the evening away in the plaza to the tunes of A1A, “the original and official Jimmy Buffett tribute band.” There will also be tons of food and drinks available for purchase on site. Mmm… we can almost smell the sea breeze now. 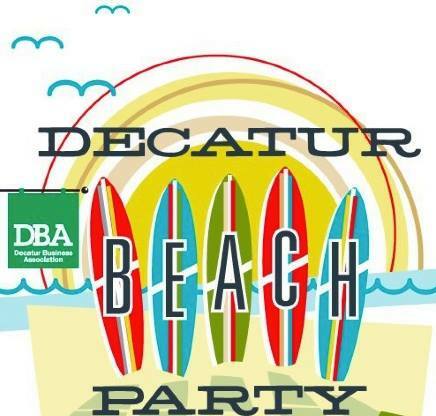 Below are some of our pro-tips on how to get the most out of your Decatur Beach Party experience. Pro-Tip #1: The Decatur MARTA station is conveniently located directly adjacent to Downtown Decatur. Save yourself time and parking money by taking public transportation. Pro-Tip #2: Adult tickets are $8 in advance and available via FreshTix. At the gate, the tickets will cost $10- so save yourself a couple bucks and buy ’em in advance. Pro-Tip #3: We’ve said it before and we’ll say it again- sunscreen is your friend. This might not be the real beach but sunburns are still very real. Pro-Tip #4: Stop by your neighborhood Target and hit the dollar section, they often have good deals on inexpensive toys that will be perfect for sand castle masterpieces. The festivities will begin at 5 p.m. and end at 11 p.m. Tickets for children (ages 3-12) cost $5, that cost includes all games and activities. Infants and toddlers, from 0-2 years of age, are free.